The performance of sacred choral works by the East Devon Choral Society are always wonderfully moving, and extremely popular with Tiverton audiences. On Saturday, despite many competing events in the town, St Paul‘s Church was filled for their performance of Felix Mendelssohn‘s glorious oratorio “Elijah“. Andrew Daldorph had prepared the choir with exceptional diligence, as always. Their massed voices rang out with the tempestuous force always associated with the dire prophesies of the Old Testament. Bass Tim Mirfin was Elijah. 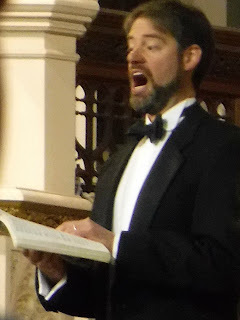 Tim is well known for his work with the Cathedral Choir in Exeter, and also his many operatic performances around the world, for which he is in great demand. He opened the concert with the decree from God that Israel would suffer several years of drought. Right on cue, Fiona McLean-Buechel led the orchestra in a furious overture reflecting both the dire prospects for the people, and the terrible majesty of their Lord. The orchestra members only meet on the day of the concert. Despite only a day’s preparation their performance was electrifying. Brass and kettle drums brought the more explosive sections to glorious life, while the strings and woodwind were equally emotive in the many gentle airs and recitatives. As always there were also splendid visiting soloists. Tenor John Graham-Hall was both Elijah’s ally Obadiah, and his adversary King Ahab. Soprano Claire Surman was the temporarily bereaved Widow of Zarephath. Mezzosoprano Louise Mott was King Ahab’s Queen Jezebel. A very special moment in the performance went to a member of the choir. 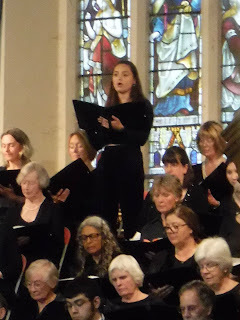 Soprano Emily Moudiotis sang beautifully as an angel from the back row, framed by spectacular stained glass images from the New Testament in the East Window. Emily also sang in recitative duet with Tim Mirfin from the pulpit – another very moving scene. Throughout, the choir provided the backbone and life of the story with their rousing choruses and narratives. From their opening cry of supplication, to their closing exaltation, their discipline and emotional energy kept the audience inspired and engaged. Once more Andrew Daldoph has brought together the combined forces of his choir and orchestra to astound and entertain with spectacular classical repertoire. Many thanks to all the performers, and everyone who works so hard behind the scenes, for making these splendid events possible. In the meantime, there will also be a Summer Charity Concert by the East Devon Choral Society in aid of the League of Friends and Tiverton Hospital – on Friday 13 July. A miraculous outpouring of indigenous vocal and instrumental talent.